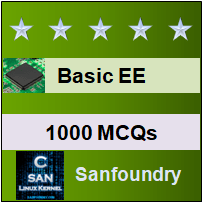 This set of Basic Electrical Engineering Multiple Choice Questions & Answers (MCQs) focuses on “Kirchhoff’s Laws and Network Solutions”. 1. Find the value of I1, I2 and I3. Solving this matrix equation, we get I1=1.5A, I2=-0.188A and I3=-1.19A. 2. Find the value of V, if the value of I3= 0A. Solving the matrix, we get V=7.5V. 3. Find the value of R if the power in the circuit is 1000W. Voltage across the 2 ohm resistor= 20V. Voltage across the R resistor= 100-20= 80V. 4. 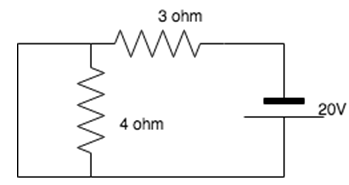 Find the current in the 4 ohm resistor. 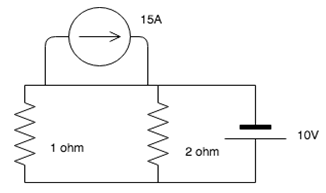 Explanation: The 4 ohm resistor gets shorted since current always prefers the low resistance path. 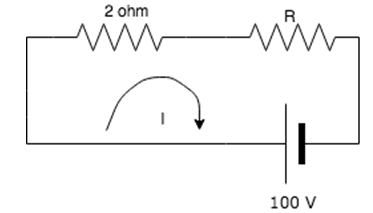 All the current flows to the branch which is connected in parallel to the 4 ohm branch, hence no current flows in the 4 ohm resistance. Explanation: Nodal analysis uses Kirchhoff’s Current Law to find all the node voltages. Hence it is a method used to determine the voltage. Explanation: Mesh analysis uses Kirchhoff’s Voltage Law to find all the mesh currents. Hence it is a method used to determine current. 7. What is the current in the circuit? Explanation: If we move in the clockwise direction, we get the total voltage to be equal to: -10-20+30= 0V. Since I=V/R= 0/4=0, I=0A. 8. Does the 15A source have any effect on the circuit? Explanation: The 15A current source has a lower resistance path associated with it and hence it keeps moving in that particular loop. It does not leave that loop and enter the circuit, hence the circuit is not affected by it. Explanation: KVL employs mesh analysis to find the different mesh currents by finding the IR products in each mesh. Explanation: KCL employs nodal analysis to find the different node voltages by finding the value if a current in each branch.